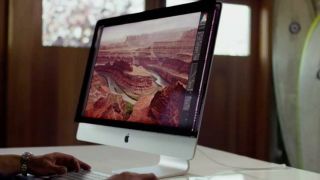 Apple has unveiled a major refresh of the iMac, one that now offers a Retina display. Dubbed the 5K Retina Display by Phil Schiller, Apple's marketing boss, the new model sports a 27-inch diagonal with a 5210 x 2880 screen resolution. That's nearly 15 million pixels, almost two thirds more than a 4K monitor and yet Apple managed to keep its thickness to a slim 5mm. With 220 ppi, it has the same pixel density as the Apple MacBook Pro Retina Display and the highest resolution of any display on the market (Dell's 5K monitor doesn't have a shipping date). The new iMac - which will be available on sale from today - also sports a new custom-made chip designed by Apple engineers and called the timing controller (as it controls the display). Other than a significant drop in power consumption (by nearly a third), the key takeaway features include a quad-core Intel i5 processor clocked at 3.5GHz, AMD's Radeon M9R290X GPU, 1TB Fusion Drive and 8GB of RAM. The new model will sell alongside the existing ones and will cost $2,499 (£1,999, AU$2,999).